This recipe is sponsored by King Oscar | Thanks for supporting the brands I love and trust. King Oscar’s Brisling Sardines with Hot Jalapeño Peppers are perfect for turning your ordinary tuna melt into something more. Fished from Norway’s fjords and coastal waters, these lightly smoked gems pack a big punch of nutrition and flavor. They’re hand-packed in extra virgin olive oil along with big slices of jalapeño peppers. If you like adding a kick to your grilled cheese sandwiches, this is the way to do it. However, if your palate or belly isn’t keen on spice, swap the brisling sardines with jalapeño peppers for King Oscar’s Brisling Sardines in Extra Virgin Olive Oil and trade the peppers for chopped up pickles. Want more ways to use King Oscar’s sardines? This healthy Greek Pita makes for a perfect lunch! You can also incorporate them into a delicious Instant Pot Spanish Rice with Sardines in Tomato Sauce for an easy weeknight dinner. If you try this recipe or create your own variation, let me know in the comments! I love connecting with you. Also, snap a photo and tag me on the Insta @killing__thyme and be featured in our newsletter. 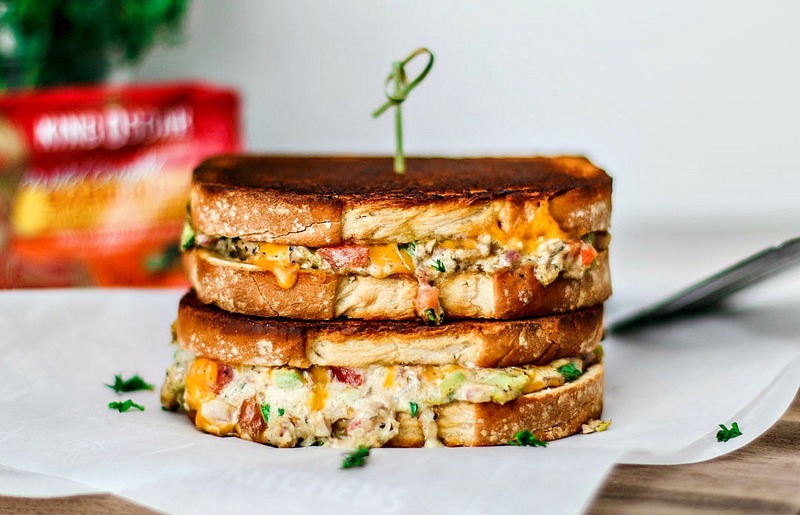 This spicy Cheddar Jalapeño Gourmet Grilled Cheese with King Oscar Sardines is melty, messy, and delicious. It's packed with veggies, protein, and omega-3 fatty acids! Preheat oven to 400° F. Butter one side of each bread slice and place the slices onto a baking sheet, buttered side down. Set aside. In a large bowl, whisk together the mayonnaise, lemon zest, and lemon juice. Drain the oil from the sardines, then dump the sardines and slices of jalapeños from the can to the mayo mixture. With a fork, break down the sardines and jalapeños, stirring them into the mixture. Add the celery, pickled jalapeños, red onion, tomatoes, and parsley to the mixture. Stir to combine until everything is thoroughly mixed; season with salt and pepper. Place one slice of cheddar on top of each bread slice (remember to make sure they're all buttered side down on the baking sheet at this point). Transfer half of the mixture onto one slice of bread, spreading it out evenly. Do the same thing with the rest of the mixture on another slice of bread. Then, close the sandwiches with the other two slices of cheese and bread. If spicy isn't your thing, you can swap the Brisling Sardines with Hot Jalapeño Peppers with another variety, like King Oscar's Brisling Sardines in Olive Oil or Zesty Tomato Sauce. Then, simply replace the TBSP of finely chopped pickled jalapeños with 2 TBSP of finely chopped dill pickles.